First of all, I would very much like to thank all of you who come to visit me here, and read my postings. It's nice that you all do that. Today, Mom set up the bird baths, and again set up the little one, just for me, on account of I'm soooo special. Makes a little pij feel all warm and fuzzy, knowing that she does special things, just for me. I can tell that Cricket likes it too. She just beams when she looks at me. And we share things together, like nesting responsibilities, and stuff like that. I try very hard to be a good mate and take my responsibilities very seriously. Of course Cricket does sit the eggs a little more than I do, as I can get kinda busy guarding my area around the nest box. Got to keep her safe. Why, just yesterday, her old beau came and tried landing on our front porch. Mom was so happy when I ran into him and threw him to the floor. He didn't come back either. So back to today. What a crowd we had at the pool! I just watched for a while from a safe distance. I did try to guard the doorway and stop everyone as they rushed outside, but today no one was listening and they just ran past me. Now that wasn't right, because I have laid claim to that WHOLE area. But then I figured they must have a right of way or something on pool day, as they just rushed past me and jumped in. Lots of activity when the pools are set up. but then I looked at all the fun the big guys were having in the big pool, so I hopped up on the side of it. I watched for a while, but it looked a bit rough to me with the crowd it was attracting. So I jumped over to the medium sized pool. It looked safer to me, so in I jumped! And I had a ball! I had my first outside bath in my new home. It was so much fun. I stayed in for a long time. Stayed right in there and preened. Mom stayed right there the whole time, just to make sure that I was safe. She only likes to put the pools out when she's around. Over cautious...............maybe, but now she has a good reason to do that, ME! Well, eventually I had to get out so that I could watch the eggs and let Cricket have her turn at the pool. But boy, that felt good! Now I will be looking forward to the next pool day. I like it here. Lots to do. And I have friends now. And a grand one it was, Virgil. I loved the pictures of you and your friends at the swimming pools. Virgil...you are quite the story teller. I think you need your very own blog where you can keep us updated on life from your perspective. You could call it...The Chronicles of Virgil. Virgil, I am so happy for you You have a wonderful home, look so healthy and are having the time of your life with your mate Cricket and all the loft activites that your Mommy has going on for you and all your new friends. Thank you. I love smooches. I just wanted to let everyone know that from now on I'll post my stories under "Feral Pigeons and Doves" and I'm going to call it THE CHRONICLES OF VIRGIL, and I hope you will come and visit me there. "When you come to the edge of all that you know, you must believe one of two things; there will be earth upon which to stand, or you will be given wings to fly." LOVE the and you can count me in as a follower!!! ............. another UPDATE!!! Location : South Eastern Ma. Thank you. I love smooches. 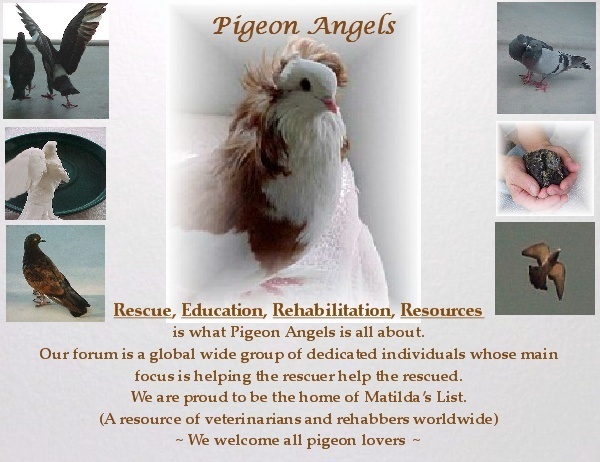 I just wanted to let everyone know that from now on I'll post my stories under "Living -with-a-special-needs-pigeon-and-or-dove" and I'm going to call it THE CHRONICLES OF VIRGIL, and I hope you will come and visit me there. Edit: While trying to fix something in my post, I deleted it and put it back, and that moved it down one post. This post should have been just before Jenns post which would explain her reply to me. That's OK, Virgil. We understand.